Windows 10 will offer SMB v1 when establishing a SMB session, even if SMB v1 is disabled. This allows the workstation (SMB client) to identify legacy systems which would only support SMB v1. A server supporting only SMB v1 will elicit the message “System error 384” on the command line and a slightly misleading message in the Windows explorer. Offering SMB v1 even if version 1 is disabled? The Sysinternals Process Explorer (https://docs.microsoft.com/en-us/sysinternals/downloads/process-explorer) offers another way to check the configuration. When running with administrator privileges the Process Explorer can list the DLLs loaded in foreign processes. Pressing Ctrl-D will reveal all DLLs loaded in the selected process. “System” is a pseudo-process that represents the Windows kernel. Instead of DLLs we will see all loaded drivers. Guess what? MrxSmb10, which would handle SMB v1, is not present. 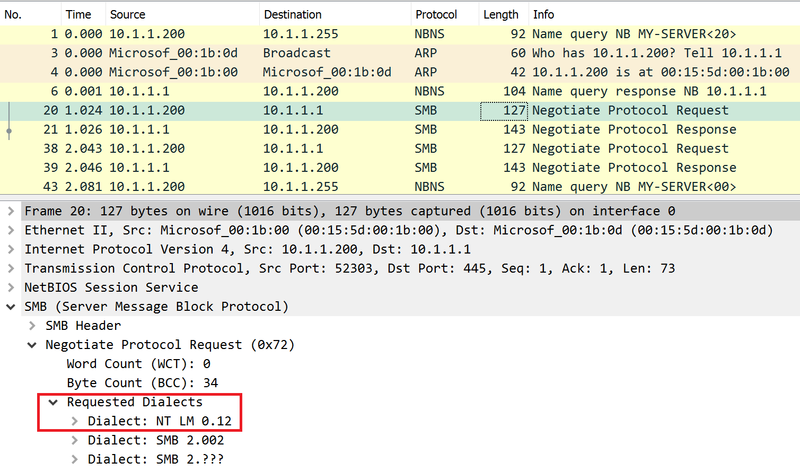 The client offers SMB v1 in the negotiate protocol request. Not knowing about SMB 2 or later the server selects this dialect in the response in frame 21. The workstation repeats the negotiate protocol request and gets the same answer. At this point the client gives up and presents an error message.